Many of Japan’s political and intellectual leaders remain committed to nuclear power even as Japanese public opinion has turned sharply against it. One argument in favor rarely gets a public airing: Japan needs to maintain its technical ability to make nuclear bombs. “I don’t think Japan needs to possess nuclear weapons, but it’s important to maintain our commercial reactors because it would allow us to produce a nuclear warhead in a short amount of time,” Shigeru Ishiba, a former defense minister, said in an interview in a recent edition of Sapio, a right-leaning twice-monthly magazine. “It’s a tacit nuclear deterrent,” added Mr. Ishiba, an influential parliament member who made similar remarks on a prime time television news show in August while serving as policy chief of Japan’s main opposition party. And indeed, there is a sense in a lot of what I’ve read that this idea of Japan’s civilian nuclear program being in part actually purposed in developing and maintaining a capacity to make nuclear weapons in short order if the need ever presented itself, is sort of accepted as a not-very-well-kept-secret within political circles in Tokyo. But with the recent amendment to the Atomic Energy Basic Act seeming, at least to the perception of many, to constitute an actual manifestation, and a legal formalization, of this longstanding not-so-secret nuclear hedging posture, South Korea, at least, is starting to get a little bit freaked out. South Korea’s foreign minister, Kim Sung-hwan, reportedly expressed his government’s concerns about the changes to Japan’s nuclear law in a meeting with Seiji Maehara, chairman of the ruling Democratic Party of Japan’s Policy Research Committee, on July 16. South Korea of course has a well known and quite nasty recent history with Japan that makes this nervousness completely understandable. And there remains serious concern in South Korea about Japan’s post-war return to economic and military power, and some pretty serious and widespread distrust of Japan’s intentions in the region. This distrust was on full show only a month ago, when the signing of a much-heralded intelligence-sharing pact between Japan and South Korea was postponed at literally the last hour, to the embarrassment of both governments, because of a public outcry against the agreement in Seoul. Speaking of history, the horrific narrative of the suffering of the Japanese people as a result of the use of nuclear weapons against Japan by the U.S. in the closing days of World War II, is also well known. I’ll never forget reading Masuji Ibuse’s Black Rain in college. Some things should never be forgotten. And since that time, Japanese society has, again quite understandably, had an intense collective revulsion for nuclear weapons, and complex feelings even about civilian nuclear energy. These feelings have manifested themselves in recent weeks through the public demonstrations of a revitalized and surprisingly durable civil society movement opposing all nuclear power in Japan. Recent public-opinion polls show the Japanese public turning against nuclear energy after the March Fukushima Daiichi nuclear accident. But even when support was high for commercial atomic use, surveys have shown the Japanese people were overwhelmingly against introducing nuclear weapons. Some 72% of respondents in a 2009 poll conducted by the Mainichi newspaper, a nationwide daily, said they supported keeping the Three Non-Nuclear Principles in tact, while only 24% wanted them revised or scrapped to allow the introduction of nuclear weapons. Japan has long had a “nuclear allergy” due to its status as the only country against which nuclear weapons were used, in 1945 attacks on Hiroshima and Nagasaki. I can understand, if only in a small, personal way, the communal trauma that the Japanese people attach to the Fukushima Daichi disaster. 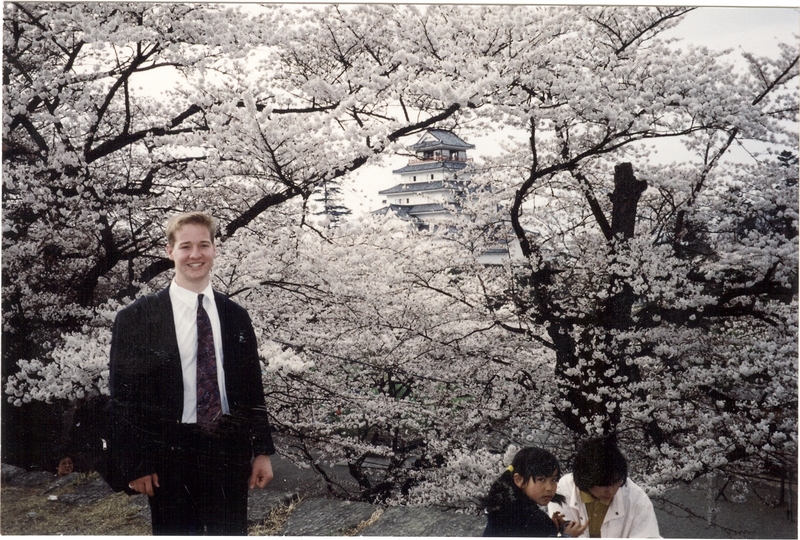 I had the privilege of living in Japan for two years, from 1993-1995. For four months of this time, in the Spring of 1994, I lived in a city called Koriyama, in Fukushima prefecture. I’ll never forget arriving in Koriyama in shigatsu (April), just as the sakura began to bloom. It was such a welcome sight after the six months I had spent freezing up in Aomori prefecture. Koriyama is about 37 miles away from the Fukushima Daichi reactor site (the picture at the top of the post is a younger, slimmer, handsomer me at Aizuwakamatsu castle nearby). I experienced my own personal shock and profound sadness as the images of the destruction caused by the earthquake and the tsunami started to pour into my television on March 11, 2011. It was heartbreaking to think of so many people – people that I had grown to love – suffering through this unbelievable calamity. And then, hard on the heels of the horrific natural disaster, came the “man-made disaster” of the meltdown of three of the reactors at the Fukushima Daichi facility, resulting in the forced evacuation of over 100,000 people from their homes. More than a year later, at least 60,000 people are unable to return to their homes near the facility, and the land up to 12 miles in radius from the Fukushima Daichi site may be uninhabitable for many decades due to the radioactive contamination produced by the meltdowns. Thinking back on it – and I have to assume that this is how many Japanese think back on it – the natural and man-made elements of the catastrophe of March 2011 in northern Japan sort of blend together in my mind. It just forms one big terrible and traumatic event in my memory. I suspect that the newfound vitality of the anti-nuclear movement in Japan takes much of its strength from this coalescing of the elements of the disaster in the minds and memories of many Japanese. I can also completely understand why the Japanese people are so upset about the recent changes to the basic atomic law, and the introduction, for the very first time, of an aspect of potential militarism into Japan’s nuclear law. As the polling numbers quoted above evidence, one thing that unites the Japanese people is their hatred for nuclear weapons and their revulsion at the very thought of Japan ever possessing, let alone using, nuclear weapons. This is something simply unimaginable to most Japanese, and they would never countenance it. And now to see their government taking steps that could be interpreted as paving the way, at least in terms of domestic law, for the potential development of Japanese nuclear weapons, has been extremely disturbing to most Japanese people who have learned about it. I think my own take away lesson from this is that the new amendment seems to be only the latest data point in a longstanding disconnect between the Government of Japan and the people of Japan regarding the uses and purposes of nuclear energy in Japan. As is so often the case in Japanese politics, it appears that this disconnect went, if not unnoticed, then largely unopposed or criticized by Japanese civil society for many years. But now the natural and the man-made elements of the March, 2011 disaster in northern Japan have together produced far more public scrutiny, and vocal and active opposition to government policies that are at odds with the will of the Japanese people. And the Japanese people clearly do not want any moves in law or policy toward a greater likelihood of Japan developing nuclear weapons. If democracy means anything, it means that elected officials must listen to and implement the longstanding and deeply rooted will of the people. At least with regard to any even colorable legal facilitation of the development of nuclear weapons in Japan, the will of the people is clear. The amendment should be repealed by the Diet. The amended law still stipulates that the utilization of atomic power is only for peaceful purposes. The “national security” is mentioned in the context of “anzen no kakuho” (translates as “safe use of atomic power” in the 2nd clause and “ensuring safety” in the 1st clause of the article 1). Therefore the amendment still forbids Japan from building nuclear weapons, and “national security” should be interpreted as indicating nuclear security issues (i.e. preventing nuclear materials from being smuggled out of the country). One more point. Hata Tsutomu was the PM in April 28 – June 30 of 1994, not 1974. It is the mistake made in the FAS webpage you cites. I do understand the interpretation you propose here, and it may well be that that was the intended meaning of the amended provision. I know that a number of parliamentarians and government officials have said that this is the correct interpretation. But I think the provision could have been better drafted to clarify that this is the intended meaning. To say that nuclear energy will only be used for peaceful purposes in one article, and then in the next article to say that the safe use of nuclear power includes its use for national security, renders the whole provision susceptible to alternative meanings. I think that’s what has troubled many Japanese people, and the South Koreans. I dont think they are necessarily convinced that the provision is intended to form the legal basis for a nuclear weapons program, but rather they are concerned that, whatever its intent, it could be used for that purpose by some future government. I know there have been discussions about adopting a formal interpretation of the provision. Again, I dont know enough about the Japanese legal system to comment on whether that would be effective, and whether it would be clear and durable enough to be satisfactory. Perhaps it would.